Orange is the most highly visible of all the colours in the spectrum, and particularly so when set against a dark, contrasting background. Water is responsible for the attenuation of light due to absorption. In other words, as one goes deeper on a dive, the water absorbs more color. Color vision is also affected by turbidity of the water as well as particulate matter. Orange is the most visible color in all types of water, and therefore offers the professional diver the best in dial and bezel visibility. For a professional diver, good visibility isn’t just mildly important; it can be lifesaving. Being able to access important information relating to the time spent under water, or the number of minutes of air supply still available to the diver who is in deep or murky waters is essential. 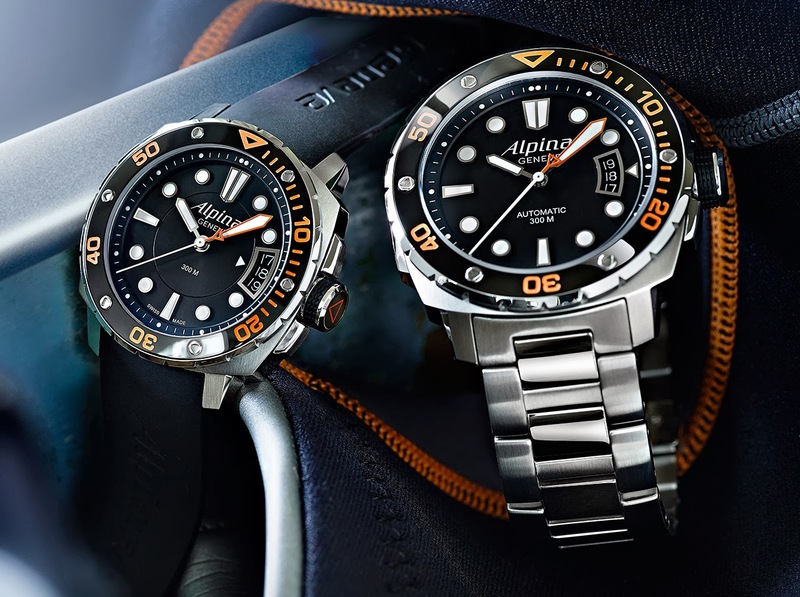 With all this in mind, the designers and engineers at Alpina are delighted to introduce the new Alpina Extreme Diver Orange range, featuring one automatic and one mid-size, quartz caliber model. Both models share a number of professional diving features. The Extreme Diver 300 Orange is water resistant to a depth of 300m/1000ft. It has a screw-in crown and a screw-down case-back, as well as a jet black polished unidirectional rotating 60min diving bezel. The bezel markers are luminous. Both models also feature an anti-reflective treated sapphire crystal. Other shared features include the rich black dial and white luminous indexes. The bright white minute hand is bordered with luminouse orange, and the second hand has the signature Alpina triangle, also in orange, at the base. Finally, a large three-day date display is situated at the 3 o’clock position. The AL-525 Automatic version in 44mm comes with a 38-hour power reserve. It has a see-through case back revealing the AL-525 automatic movement. The package is completed by a choice of diver’s rubber, metal or metal mesh straps with securely folding clasp. The Extreme Diver 300 Automatic comes in a specially designed gift box, uniquely shaped as a diving bottle, and containing an extra swimsuit nylon strap. The AL-240 Midsize quartz model in 38mm comes with 45 months battery life. It has an engraved case-back with a diving theme and divers have the choice between rubber or metal straps.